To introduce Morovia UPC-A/UPC-E/EAN-8/EAN-13/Bookland Barcode Font, we are offering a $549 SPECIAL LIMITED TIME OFFER for this version! Click here to order now! Morovia UPC/EAN/Bookland barcode font consists of 5 true type fonts and a tool kit. At any point size, there are 5 different barcode heights to choose from. The tool kit contains the FontPal software and its source code in both Visual Basic and ANSI C. The FontPal software is used to calculate barcode checkdigit and build mapping string. 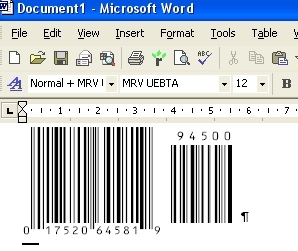 We trust that you will find Morovia barcode font to be satisfactory and look forward to receiving your order.